Nationally recognized plastic surgeon and 1999 Lake Erie College of Osteopathic Medicine graduate Joseph Racanelli, DO introduced the LECOM Class of 2016 to the rigors of clinical medicine when they received their first white coats. The white coat ceremony, held on Saturday at the Erie Warner Theater, marks a transition from basic sciences into clinical training that the students will begin receiving this fall. 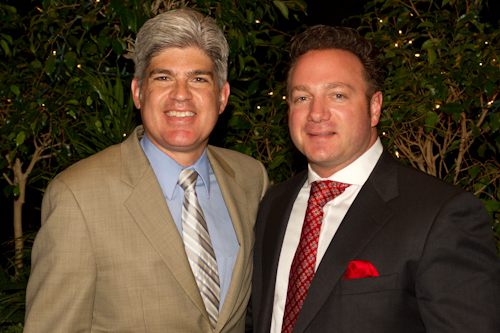 Mark Monaco, DO, (L) President of POMA and Joseph Racanelli, DO (R) addressed the LECOM Medical class of 2016. The LECOM College of Medicine Class of 2016 numbers 272 students. They are mid-way through their first semester. After studying anatomy and basic sciences for seven weeks, they’re eager to start clinical training that prepares the students to see patients. Dr. Racanelli gave the students some real world advice about how to survive medical school. He recalled the roadblocks that he encountered, and how he was able to navigate around them. He told the students to start thinking now about what you want to do in medicine. “Rotate through hospitals that have residencies and fellowships in specialties that you are interested in,” he said. “Make a good impression, work hard, and NETWORK -NETWORK -NETWORK.” He added that their hard work now will pay off when they compete against students from other medical schools for the top residency spots. The President of the Pennsylvania Osteopathic Medical Association (POMA) presented new stethoscopes to each medical students. Mark Monaco, D.O. spoke to the students about the important role POMA has in maintaining the high standards of medical education and promoting public health in the Commonwealth. The state organization provides the white coats given to the students. Danielle DeBias, PharmD addressed the pharmacy class of 2016. LECOM School of Pharmacy Class of 2015 will also receive white coats during a separate ceremony at on Saturday. 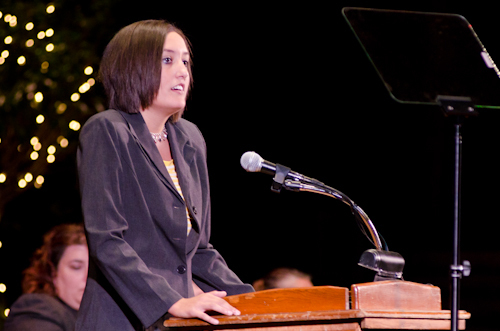 Faculty member Danielle DeBias, PharmD, LECOM Class of 2009, addressed the 143 pharmacy students of the Class of 2015. LECOM Erie pharmacy students graduate with the doctor of pharmacy degree in a fast-track, three-year program. Rite-Aid provides the pharmacy white coats. To view photos the LECOM Erie White Coat Ceremonies, please visit the LECOM SmugMug Photo Gallery.